Let us examine the facts. Sunderland sit fourth in the table, three points from an automatic promotion place with two games in hand over Barnsley in second. They’re nine points from the top side Luton, but have played three games fewer. Third placed Portsmouth are wobbling. Sunderland have only lost twice, scored in every game, are unbeaten at home and no side has conceded fewer goals. Most people believe they had a good January transfer window too. Most Sunderland fans have been positive about promotion. So you might think that even the most dedicated whinger and doom spreader would have their work cut out to talk them down. Is it even possible to conclude that promotion is out of the question? Not a bit of it. We struggle to recall a victory with more criticism and snide pessimism attached than Saturday’s 1-0 win over Wimbledon. When Manchester United played badly on Sunday and won, it was “the sign of a good team”. When Sunderland did the same thing a day earlier, it was a sign that they’re useless, according to some. Wimbledon are rock bottom and clearly not great. But they had nothing to lose and when teams visit the Stadium of Light this season, they are enervated by what for many League One footballers is the biggest crowd they will ever play before. The visitors had also stuck four past West Ham in their previous fixture. Rock bottom or not, only the very daftest could assume that Sunderland would or should breeze past the opposition. Nevertheless, let’s examine some other facts: if only to oblige the vocal minority who insist on vomiting negativity. Points on the board are better than games in hand. Sunderland need more goals. They haven’t scored more than once in any of their last eight matches and draw too often. They haven’t played particularly well in all but a few matches and seem to freeze when they take the lead. But that isn’t the game plan. 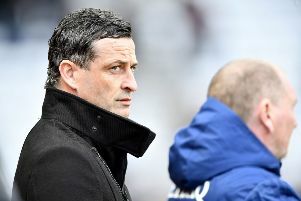 Jack Ross does not instruct his players not to score twice, or to cease attacking once they’re winning. This is not a tactic: it’s a mindset that needs to change. Ross is aware of the problem and has addressed it; mainly with the signing of Will Grigg, a proven goal scorer, and the steadying hand of Grant Leadbitter. Barnsley and Luton are in better form than Sunderland; so it’s worth remembering that form is temporary. Promotion can’t be promised. What’s certain is that a positive attitude from everyone concerned – including the fans – is massively helpful. Happily, Sunderland’s support is magnificent overall and doesn’t go into an infantile huff because “the likes of” Wimbledon weren’t beaten nine-nil. But there must always be a whining minority, who imagine that if you don’t constantly carp and find fault, it’s because you lack their encyclopaedic knowledge of the game. There is plenty to correct at Sunderland and promotion is far from guaranteed. Yet it is possible to be aware of this and remain positive. To the huge majority of fans I say “well done”. They are hugely important and undoubtedly make an invaluable contribution. To the perpetually disgruntled: we know you’re entitled to your opinion (there’s no need to contact me and point this out). You don’t have to grasp the concept of constructive criticism. Nor are you obliged to shut up or stop booing. It’s just that it would be appreciated by everyone else if you did.